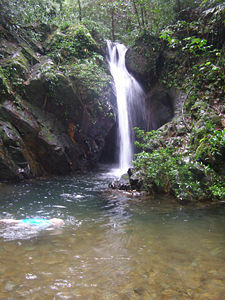 Waterfall in a tributary of South Stann Creek, Cockscomb Basin, Belize. The Cockscomb Basin Wildlife Sanctuary is a nature reserve in south-central Belize established to protect the forests, fauna and watersheds covering approximately 400 square kilometers (150 sq mi) of the eastern slopes of the Maya Mountains. Declared a Forest Preserve in 1984 and a Jaguar Preserve in 1986, Belize expanded the Sanctuary substantially in 1990 and again in 1995. It was the first wilderness sanctuary for the jaguar and is regarded as the premier site for jaguar preservation in the world. The site consists of two distinct adjacent watersheds and is accessible via a low intensity trail system to accommodate visitors and researchers. The Maya Mountains and foothills are among the oldest surface rock formations of Central America; these Paleozoic sediments were uplifted about 200 million years ago in the Pennsylvanian epoch and early Permian period. The principal uplifted rock formations in the Sanctuary are quartzite and sandstone. The name Cockscomb derives from the appearance of the Cockscomb Mountains ridge that resembles a rooster's comb. 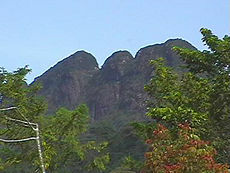 The ridge is situated at the northern fringe of the reserve and is easily visible from the coastal plain of the Caribbean Sea. Habitation by the ancient Maya civilization occurred in the Cockscomb Basin as early as 1000 B.C.E. and the Sanctuary hosts several archeological sites. Principal plant communities are Pine forest, Elfin scrub, tropical moist broadleaf forest, shelter valley forest and floodplain thicket. Victoria Peak (elevation 1,160 meters (3,806 ft)), is the second highest mountain in Belize. The Cockscomb Basin Wildlife Sanctuary is the world's only Jaguar Preserve. Throughout much of the foothills of the eastern slopes in southern Belize, there is evidence of Mayan habitation since at least 1000 B.C.E. The Pearce Ruin was the first Mayan site to have been cataloged in modern history archives in a report to the British Museum in 1931; however, the ruin was not re-sighted until 1995 with the Dunham surveys. At that late date two other Mayan sites were documented: Hun' Tul Mo' ("one macaw") and Xa'a Yul Ha' ("many rivers"). The first modern explorations that led to recorded geographical features of the Cockscomb Basin were conducted by the British expeditions of 1888 and 1889. These explorations included river excursions up the South Stann Creek and what was believed to be the ascent of Victoria Peak. Later reconstructions showed that the explorers actually scaled a nearby peak that they mistakenly labeled Victoria Peak. Further exploration of the Cockscomb Basin did not transpire until 1927, when further British expeditions were launched to assess timber reserves; subsequently, logging began to occur until the year 1984, primarily with extraction of cedar and mahogany. 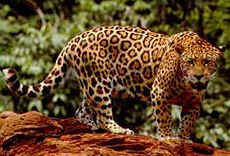 At about the same time as exploitation of these resources was virtually complete, a nationwide study of the jaguar was initiated. This scientific investigation led by Dr. Alan Rabinowitz, an American zoologist, found that the Cockscomb Basin was a particularly important habitat for the jaguar, not only in Belize, but from a Central America perspective. In 1986, Rabinowitz and Archie Carr III, an American biologist, convinced the government of Belize to establish a no-hunting zone with respect to jaguars in a portion of the Cockscomb Basin. By 1990, after further prodding, the Belize government expanded the Sanctuary substantially, and in 1995 another 160 square kilometers (62 sq mi) were added to connect the holding to the Bladen Branch Nature Reserve. In 1988, the International Union for Conservation of Nature declared the Cockscomb Basin Wildlife Sanctuary "The major achievement in cat conservation for the triennium." In that year, Prince Philip as president of World Wide Fund for Nature, honored Ignacio Pop for his work in encouraging creation of the reserve. In 1998, the Victoria Peak National Monument area was established embracing 19.59 square kilometers (7.56 sq mi) of protected land. Looking across a narrow valley in the Cockscomb West Basin broadleaf forest. South Stann Creek on valley floor of Cockscomb West Basin. Plant on the forest floor of Cockscomb West Basin. The Cockscomb Basin Wildlife Sanctuary can be described as a thin rhombus-shape spanning an east-west dimension of approximately 36 kilometers (22 mi) and a north-south dimension of approximately 14 kilometers (8.7 mi). Elevation extremes are 50 metres (160 ft) above sea level in the lower reaches of South Stann Creek to 1,160 metres (3,800 ft) atop Victoria Peak. The sanctuary comprises two adjacent geographic basins; the East Basin and the West Basin. The East Basin consists of the upper watershed of South Stann Creek. It is bounded on the north by the namesake Cockscomb ridge, to the west by the low lying north-south ridge separating the two basins, to the east by Cabbage Haul Ridge and to the south by Stann Creek Ridge. South Stann Creek flows out of the East Basin on the south in a meandering gentle gradient that was easily navigated by the British explorers in the 1880s. The West Basin is bounded by the ridge of the Maya Mountains on the west, a prominent transverse ridge of the Maya at the south (of about elevation 1,000 metres (3,300 ft)) and a low lying north-south ridge at the east, which separates the West from East Basin. The Cockscomb Mountains are on the north. The West Basin, being more difficult to access given distance from trailheads and higher forest density, is relatively unexplored from the standpoint of species mapping, Mayan ruins and other environmental details. The Monkey River rises in the Maya Mountains and discharges to the Caribbean Sea near Monkey River Town. 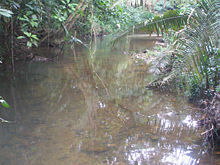 One of Belize's major rivers, it has northern headwaters which originate in the Cockscomb Sanctuary, where the Swasey Branch drains the East Basin of the sanctuary. Further south, the Bladen Branch watercourse drains the eastern slopes of the Maya Mountains including the ancient Mayan settlement areas of Lubaantun and Nim Li Punit. These two watercourses join to form the Monkey River approximately 16 kilometers (9.9 mi) upstream from the mouth of the Monkey River. 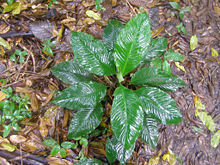 The Sanctuary's principal forest type is tropical moist broadleaf forest, which covers moderate to steep slopes and in some cases sheltered mountain valleys. While much of this forest is secondary due to Mayan era farming as well as modern logging, some of the steeper reaches exhibit primary forest characteristics. Dominant trees in this forest type are mahogany and cedar, which were prized and hence heavily logged from the early to late 1900s. Swift moving clear mountain streams flow to the valley floors of the two basins to yield a more turbid water quality, especially during periods of peak rain. This site is known world-wide as the premier habitat for the jaguar (Panthera onca), who is most often found in the vast almost unexplored West Basin wilderness. 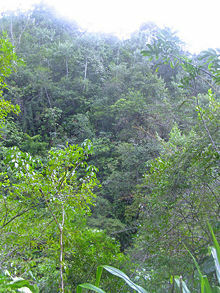 The riparian forest areas generally feature lush broadleaf jungle intruding into the verges of fast flowing steep mountain streams as well as the languid meandering valley drainages. There are particularly interesting assemblages of vegetation along the rocky bedded mountain streams which have frequent rapids, waterfalls and deep pools. Due to the density of vegetation and frequent precipitation events, the jungle floor often appears fresh and verdant even after several rainless days. Habitats in the basin provide cover for such diverse species as the ocelot, howler monkey, Bare-throated Tiger Heron, Morelet's Crocodile, Fer-de-Lance and manatee. Common wildlife includes the peccary, paca (also known as gibnut), agouti, snakes, peccary, brocket deer, tayra, otter, and coatimundi. Cockscomb has over 300 recorded species of birds. These include the macaw, the great curossow, and the keel-billed toucan. 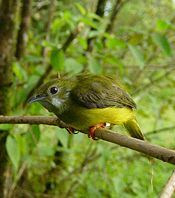 Other prolific species include clay-colored robins, social flycatchers, collared-seed eaters, crimson collared and masked tanagers, as well as bat falcons. The Belize government has set aside 390 square kilometers (150 sq mi) of rain forest in the Cockscomb Basin Wildlife Preserve, which currently provides a protected environment for around 200 jaguars, the largest concentration of the wild cats species in the world. Other resident cats include the cougar, ocelot, jaguarundi, and margay. The Tayra is common in the Sanctuary. The Margay is a solitary and nocturnal animal that prefers remote sections of the rainforest. The Collared Peccary bears a superficial resemblance to a wild pig. The White-collared Manakin is found deep in the forest. 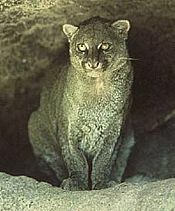 The Jaguarundi is a medium-sized wild cat that is closely related to the much larger and heavier cougar. 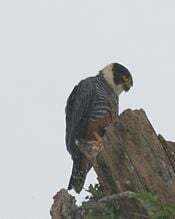 The bat falcon is a resident breeder in Cockscomb. ↑ Katherine M. Emmons, Cockscomb Basin Wildlife Sanctuary: Its History, Flora, and Fauna for Visitors, Teachers, and Scientists (Caye Caulker, Belize: Producciones de la Hamaca, 1996, ISBN 9780963798220). ↑ A.R. Rabinowitz, Jaguar: One Man's Battle to Establish the World's First Jaguar Preserve (New York: Anchor Books, 1991, ISBN 9780385415194). ↑ Biodiversity and Environmental Resource Data System of Belize, Victoria Peak National Monument. Retrieved January 9, 2009. ↑ Michael Shapiro, Hiking the Maya Way, Belize National Parks, Natural Reserves, & Wildlife Sanctuaries. Retrieved January 9, 2009. Belize Audubon Society. Cockscomb Basin Wildlife Sanctuary. Retrieved January 8, 2009. Casado Internet Group. Cockscomb Basin Wildlife Sanctuary and Jaguar Preserve. Retrieved January 8, 2009. Emmons, Katherine M. 1996. Cockscomb Basin Wildlife Sanctuary: Its History, Flora, and Fauna for Visitors, Teachers, and Scientists. Caye Caulker, Belize: Producciones de la Hamaca. ISBN 9780963798220. Rabinowitz, A.R. Jaguar: One Man's Battle to Establish the World's First Jaguar Preserve. New York, NY: Anchor Books, 1991. ISBN 9780385415194. Redington, Kerrien. 1993. Tropical Forests and Their Conservation: An Education Manual for Standards IV, V, VI. Caye Caulker, Belize: Producciones de la Hamaca. ISBN 9789768142016. Stann Creek. Cockscomb Basin Wildlife Sanctuary. Retrieved January 8, 2009. History of "Cockscomb Basin Wildlife Sanctuary"
This page was last modified on 30 November 2012, at 00:18.